Canvas Drawstring Bags, Wholesale & Bulk - Fast & Quality! Wholesale Canvas Drawstring Bags - Bulk Canvas Bags - High Quality & Quick Delivery! A preferred provider of canvas drawstring bags, State Line Bag Co. stocks over one million bags so you can get your bags in no time if your order is placed before 1 p.m. Central time. Wholesale canvas drawstring bags are shipped the day you order, and our affordable prices make us a leader in the industry for high end canvas drawstring bags in bulk. High quality products and superior customer service have helped State Line Bag Company grow with hundreds of repeat customers. Companies, individuals and other businesses in the market for wholesale canvas drawstring bags will love our exceptional line of canvas bags, which can be personalized or printed to add to their appeal. Get all of the details about our premier bulk canvas drawstring bags by calling State Line Bag Company today. When you are after canvas drawstring bags in bulk you shouldn't have to sacrifice quality for low prices. Unfortunately, many companies online who sell canvas drawstring bags offer less than top-notch quality in order to protect their profits. At State Line Bag Co. we focus on quality first and offer our customers high end canvas drawstring bags in bulk at the lowest possible price. Great products, great prices. From individuals and small businesses to larger companies and organizations, State Line Bag Company supplies customers of all sizes with canvas drawstring bags that can be printed or personalized for events, special occasions or other needs. Our creative staff is happy to work its magic so that instead of wholesale canvas drawstring bags that are plain, you enjoy customized bags. When it comes to our customers we believe in a personal approach to ensure satisfaction! From smaller bulk canvas drawstring bags such a 2" x 3" to larger bags that are 16" x 20", our canvas drawstring bags are available in a wide range of sizes for all of your needs. 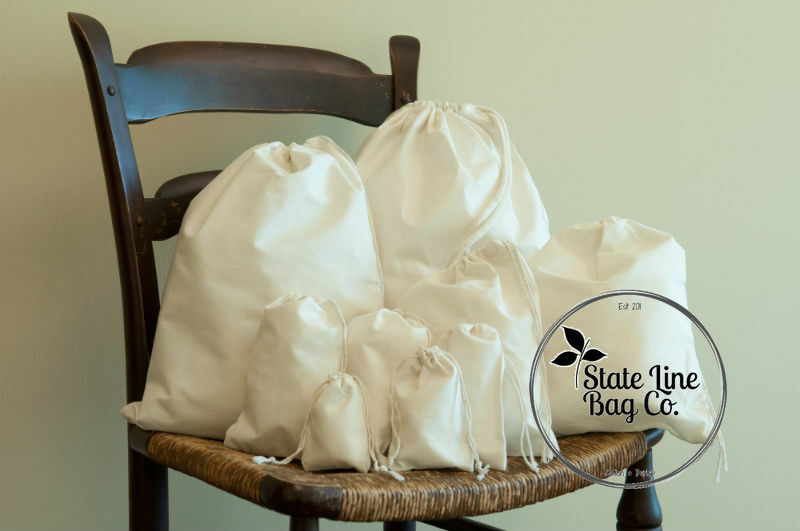 Trust State Line Bag Co. for all of your wholesale and bulk canvas drawstring bag needs! High quality bags for endless uses at the lowest price you will find - it's what we do. Contact us now by calling (913) 269-6404 or email our team at https://statelinebag.com/contact-us.